A couple of months ago, my mom found “some children’s chairs” at Goodwill for $2 a piece, so she called and asked if I wanted them for Dono. “Sure!” I said. If there’s one thing kids love, its small versions of grown-up things. Note to self: In the future, ask mom to quantify "a few". 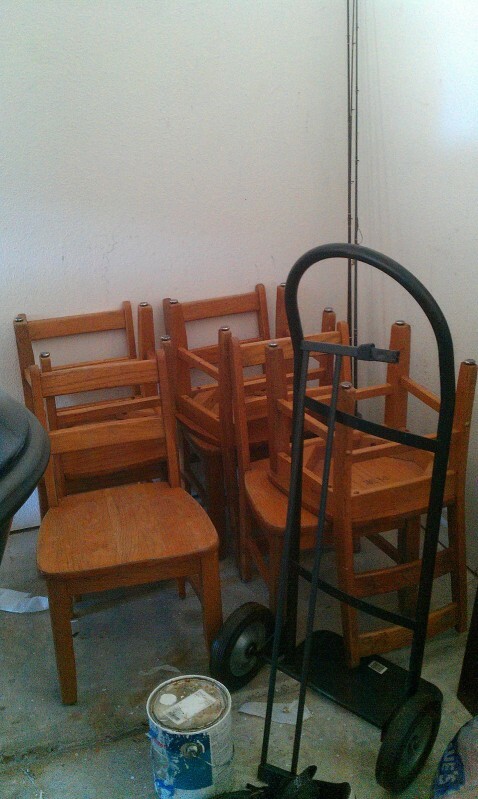 A few days later, mom shows up at my house, her SUV cram-packed with small wooden chairs. My first thought was “how am I going to explain ALL these tiny chairs too Pool Boy?” Fortunately he quit looking for explanations years ago and just rolls with it now. 7 of the chairs are identical and 2 are slightly “fancier”. I immediately invisioned having all of the major holidays at our house, complete with a proper children’s table including these adorable little chairs. To be fair, PB does have a massive family with several children under the age of 4, so there’s a good chance these chairs will be actually put to use at least a few times. "We've had a hard life." The only problem is that they weren’t in great shape. They had belonged to some school where they were apparently used and abused for years. Still, once the screws were tightned they were sturdy enough to easily hold me and/or PB, so the only thing left to do was cover up their battle scars. In an effort to NOT spend tons of money on $2 chairs which will likely be used a few times at most, I started looking around the house. 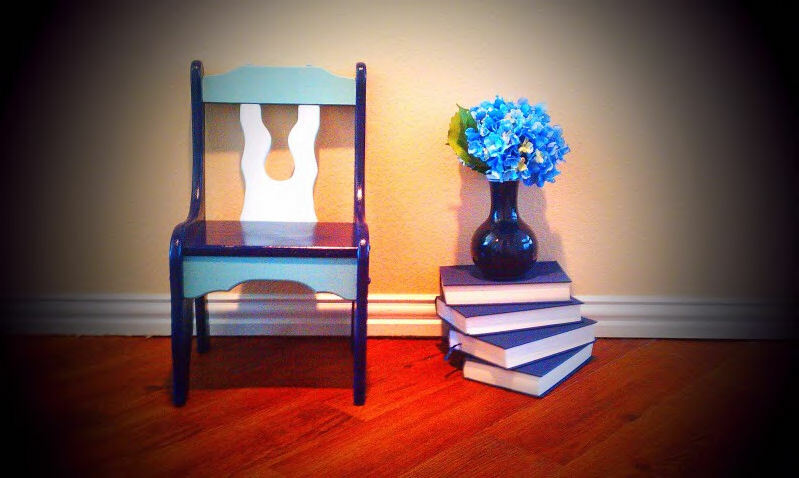 I had navy paint left over from my dumpster-desk project and 2 other shades of blue left from the bathroom spruce up. My first thought was to paint each chair a solid color, but then I decided they might look a little disjointed all sitting together. So instead, I decided to colorblock them and mix up which colors went where with each chair. That way they will coordinate but not be too matchy-matchy. I think the final result is sort of Ralph Lauren-esque, if RL made tiny little chairs!